26 Apr 19, 03:40 am » Welcome, Guest. Please login or register. 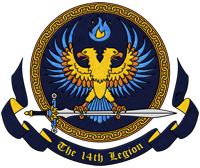 The 14th Legion of the Dukarrus army. Originally kept a secret they operated in the shadows for Lord Turi Dukarrus, his own personal unit that acted as a “Internal Police” of his legions. Members of the 14th legion often investigated other sections of the Dukarrus army rooting out and publicly executing anyone wishing to become a turncoat or was found to be secretly plotting against the army. However, times have changes and with House Dukarrus retreating from the field of battle, Lord Dukarrus sets the 14th to another task; bringing the fear of the Netherese empire to Hadrian. With the great losses of life whilst fighting the Cult, the 14th legion were deployed to Hadrian to fix its current lawlessness. They make their punishments very public and rely on a level of fear to enforce law, using things like branding and burning traitors alive in the town square. They adopt a unique outlook amongst the army, denying the use of and focusing on the resistance of Arcane magic. Legion chemists ensure that their recruits also focus on the enhancement of the human physical form, using alchemical stimulants and an often deadly and painful initiation process. Due to the ever growing desire to perfect the human condition, only humans are accepted into the 14th, primarily as fighters with occasional clerics. On very rare cases non-martial classes such as are accepted as specialty units, but this is not common, and any users of Arcane are immediately turned away. // OOC Best way to join is seek out a current PC member or contact a DM.